I was delighted that WKTV reports some good news: www.wktv.com/community/Peterboro-Prepares-for-Sesquicentennial-of-the-Civil-War-112933414.html Peterboro already preparing for Sesquicentennial of the Civil War. 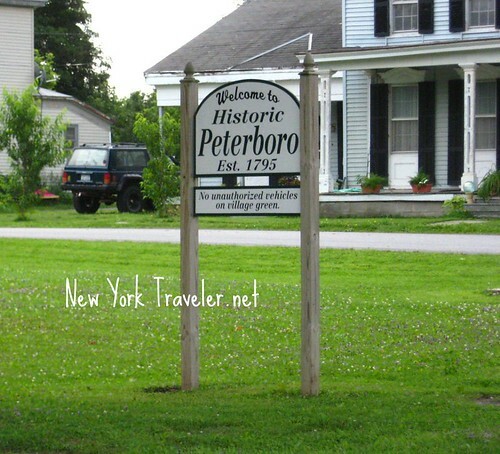 PETERBORO, N.Y. – 1861 marked the beginning of the American Civil War. The 19th Annual Peterboro Civil War Weekend Committee plans to include programs that reflect the 150th anniversary of that conflict. Among the plans in the works: President Lincoln will share his thoughts and feelings upon his March 4 inauguration, a relative of Edmund Ruffin (the man who fired the first shot at Fort Sumter) will share that history, and the Saturday evening concert will include references to 1861. The annual event will be held in Peterboro Saturday and Sunday, June 11 and 12, 2011. We are definitely making it to this celebration! 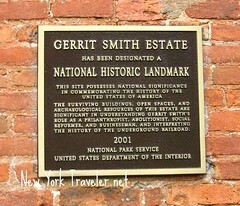 I have written about Gerrit Smith, famed philathropist and abolitionist several times. Smith was THE man most responsible for the abolition movement in Upstate New York, inspired by the preachings of Charles Grandison Finney to “love one another” regardless of skin color and financial situation. It was a remarkable movement for it’s time. You can read about our stop by the estate in Peterboro here. You can read more about his passion here, and Smith’s mysterious admittance to the Lunatic Asylum in Utica here. We also visited the old home of the Higinbotham home in Oneida, NY, close friends of his. Of course, the Civil War was not about slavery exactly (it was about state’s rights, a very relevant issue to this day); slavery was the impetus for the struggle between the states. According to WKTV, hours for the Saturday, June 11 are 10am to 5pm, and Sunday, and 10am to 4pm for June 11. Admission is $7 for adults, $3 for ages 6-12, and free for children under 6 years of age. Admission to the to the special Civil War concert at 8 p.m. may be paid at the door. Parking is free!